The Arduino is a great tool for investigating the world. We often build gadgets to measure something. 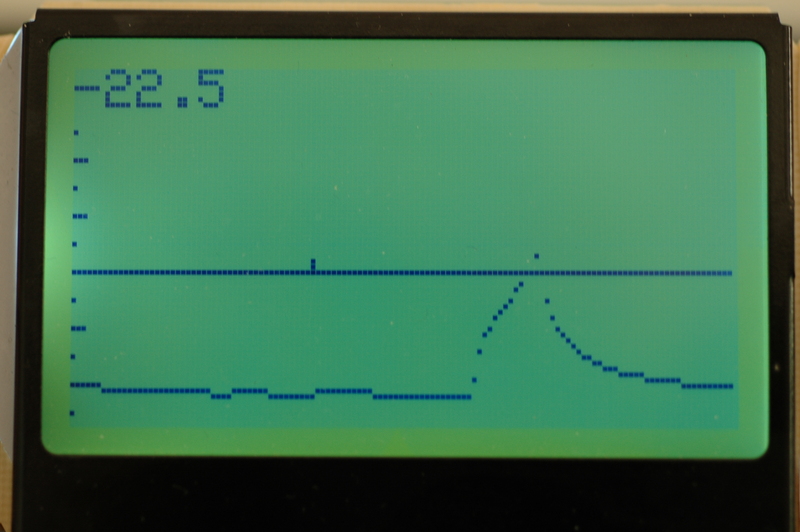 An Arduino can measure time and voltage, interface with a huge array of I2C and SPI digital sensors and connect to computers and the Internet. Compressing or expanding time is a recurring theme. Capturing data from very fast or slow events and then displaying it at human scale. We had a problem getting the temperature in the fridge right. A few degrees too cold and the food freezes. To warm and the life of items like dairy suffers. Here’s a gadget we built to make some measurements. 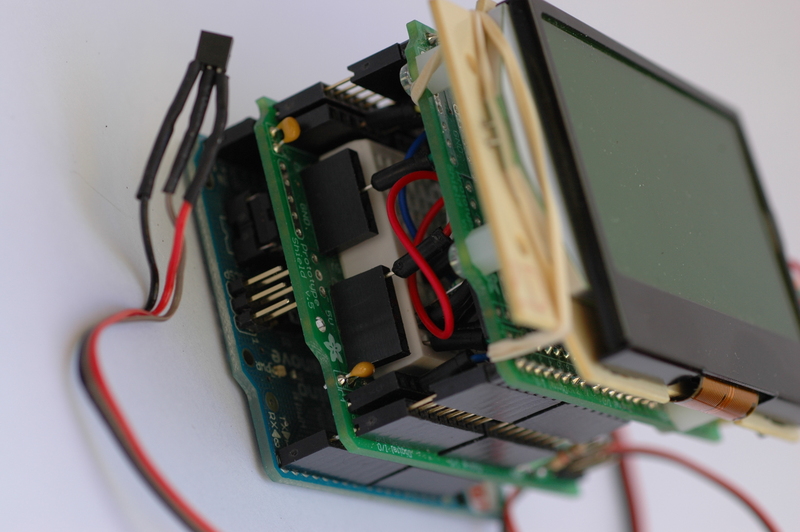 A protoshield with a breadboard is sandwiched between the Ardiuno and the LCD on top. It measures the temperature every few seconds and plots a graph on the LCD so you can see what happens over the course of the day. The Dallas DS18B20 is a favourite. It’s a digital thermometer with 0.5 degree accuracy which communicates over a 1-Wire bus. You can connect a bunch of these to the same set of three wires – each sensor has it own address that you use to read the value. 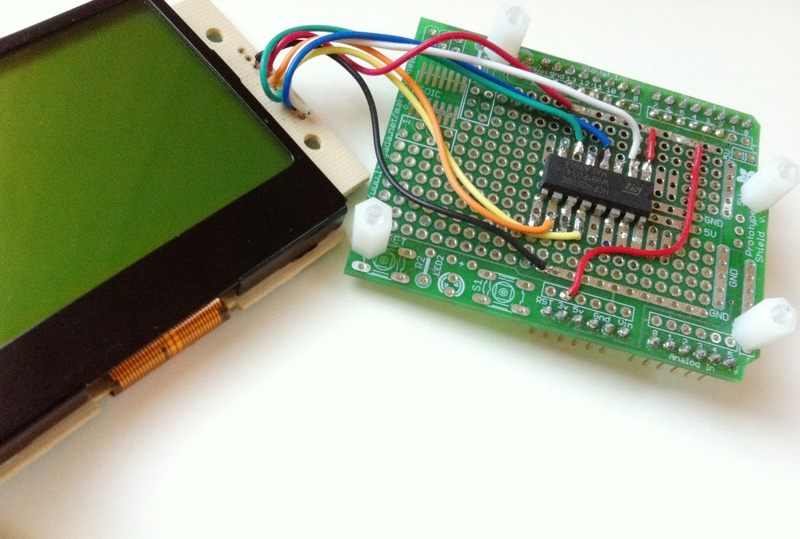 The LCD shield in the gadget is home-made and gets used a lot. It’s built from a ST7565 LCD, nylon standoffs, rubber bands and an Adafruit protoshield. A 4050 level shifter is required to convert the 5V Arduino logic to the 3.3V required by the display. The result is a shield that’s easy to use for basic data visualisation. For this type of application, you want to use a display with a serial interface, rather than parallel. The ST7565 uses 4 or 5 pins. The more common KS0108 LCD’s uses 13 or 14 pins, which leaves very few pins for your project. Adafruit also have an SPI LCD that would be good for general use. Here’s the result. The graph shows the temperature in our freezer over several hours. The freezer is self defrosting. You can see it rapidly drives the air temperature in the compartment to just above zero to melt the surface ice. Then the cooling cycle starts and the melted surface ice evaporates and condenses on the freezer coils. However, most of the time the freezer compartment is below -20 degrees C.
We also used the gadget to adjust the refrigerator temperature so that it was as cold as possible, without ever approaching freezing. Arduino source code is here or in the repository. Thank you for sharing your knowledge. It’s still useful after several years. I will try to use Nokia 8448 screen for same type of project. Let’s see what happens. « Earthquakes. We’ve had some.